The late Carl Mickey, Sr., patriarch of Mickey Truck Bodies for five decades, was known as an inventor and innovator. On his watch, the second generation owner ushered the company his father founded in 1904 into an era of prolific growth in the truck body and trailer manufacturing industry. His vision to be “the best company” in the business by “offering great products at fair prices” was driven by automation, technology and customer service. And when opportunity knocked – whether it was for breakthrough features in side load delivery, design enhancements in emergency vehicles or more efficient refrigeration systems in van bodies – someone was always there to open the door. Mickey is working with the oil and gas industry to develop state-of-the-art data acquisition and control centers, like this one. Opportunity knocked most recently as oil and natural gas companies of all sizes began to use advanced systems to find hidden places where oil and gas deposits exist in abundance. And new drilling technology like hydro fracturing – or “fracking” – is being utilized to bring these products to the surface economically. Mickey is currently working with a few leading designers and manufacturers of specialized equipment for the oil and gas industry to develop prototypes for state-of-the-art data acquisition and control centers to be used at drilling sites. This summer Mickey collaborated on a centralized command center and other projects to control all the critical well site equipment while monitoring, recording and supervising the fracturing process from a single operator workstation. 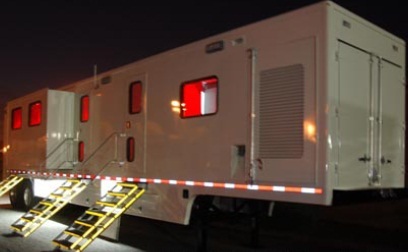 The shell of the command center is an all-aluminum Mickey engineered trailer. That’s the philosophy behind Mickey’s unique Service Delivery Model, a chain of processes designed to turn a customer’s requirements into engineering solutions that meet expectations for strength, functionality, quality and appearance. The Service Delivery Model starts with a clear understanding of the customer’s business objectives and an accurate assessment of the specific vehicle’s operational environment to deliver a final product on spec, on time and on budget. The process also draws on Mickey’s century of vehicle engineering and manufacturing experience, expertise and innovation. “Our manufacturing flexibility is being embraced in the oil and gas marketplace. In the past, oil and gas companies needed equipment immediately, and typically purchased what was available,” says Arland. “Today, with more competition and new drilling techniques requiring greater efficiency, companies are looking for enhanced designs and solutions for oil field equipment.” Traditionally, manufacturers tended to “design one unit and sell it to everybody. At Mickey, we build every unit to our customer’s specifications. The future is bright for the fossil fuel market, particularly as natural gas continues to make significant inroads as a value-oriented energy resource for a multitude of industries. Mickey is fully capable and absolutely committed to playing a role in the long term success of the industry.